Genea-Musings: Dear Randy: How Do You Deal With "Possible" Ancestors? Dear Randy: How Do You Deal With "Possible" Ancestors? "Possible question for discussion on your blog, if you have not addressed it in the past. The Ben Franklin post today raised it for me. You mentioned scraps of data that you had run across in the past and later discounted for various reasons. "I'm often finding similar situations, where I've picked up a few pieces of electronic information leading me to believe there's family connection. I usually put that into my Ancestry tree marking the information and the person's connection to others in the tree as HYPOTHETICAL until I can do some additional research to prove or disprove the point. "Do you have a process you use in such cases so as not to lose the info, but to ensure it's not taken as gospel when you come back to it in a day/week/month or by others who may have access to your tree?" 1) If it is a person who might be an ancestor, then I will add it to my RootsMagic family tree program as an unattached person, and add the events, notes, and sources that I find by searching. If I find information that provides convincing evidence of a relationship to one of my ancestors, then I add the connection. An example is Henry Carringer, born in Germany in about 1731, who enlisted in a Pennsylvania regiment in 1757 in southwestern Pennsylvania. A man named Henry Geringer had four children baptized in a Lancaster, Pennsylvania church around 1760. A man named Henry Carringer bought land in 1782 in Frederick, Maryland. These may be the same person, or may not be. 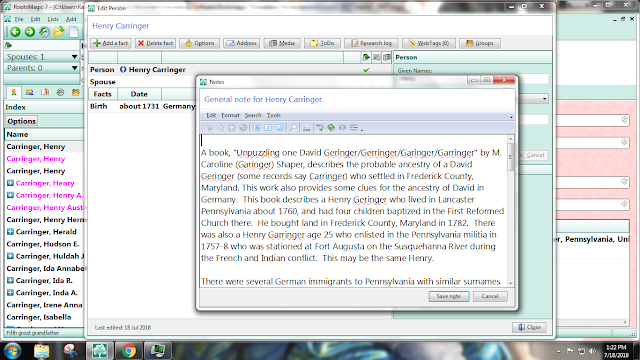 I entered a Henry Carringer profile to my RootsMagic tree, and added the notes and sources I found. He is unattached to any other person in my RootsMagic tree. I have not connected him yet to my 4th great-grandfather, Martin Carringer (1758-1835) of Pennsylvania. 2) If it is a person in one of my one name studies, then I will add them to my RootsMagic tree as an unattached person, and add the events, notes and sources that I find by searching. A search will often find convincing information that identifies the relationship to parents or children, and I add the connection. An example would be a Seaver person that I find while "mining" an Ancestry, FamilySearch, MyHeritage, etc. record collection. I add an unattached profile, add the events, notes and sources found, then hunt for more data and relationships. I have quite a few very small Seaver "twigs" or "bushes" in my RootsMagic tree. Some of them are not descended from my Seaver line, but I keep them in my tree so that they might help other researchers. 3) For some DNA Matches, I start a private Ancestry Member Tree to try to find a common ancestor to myself, using available information from the match. This works great if you have an Ancestry subscription and can use Hints to build out the tree, and then hunt for more data by searching on all of the record providers. If the private tree research finds a common ancestor to me, then I will add the descendants from the common ancestors to the DNA match. 4) I have done the same thing for "little projects" - for instance, a friend at church wondered if he had Indian ancestors through one of his great-grandmothers. I volunteered to take his great-grandmother's line back as far as I could to look for possible ancestors, and created a private Ancestry tree, used the Hints, and then searched for more records. I was unable to find any significant records that other Ancestry Trees didn't have. I guess my bottom line is that I will add unattached persons to my RootsMagic tree if I am possibly related, but will start a private Ancestry Member Tree for other projects for persons who are not my ancestral family. I haven't added too many unattached people to my tree. I'm afraid I'm going to forget they are there. How do you keep track of them? Thanks for this. As always good suggestions. But I have the same concern as Lisa, that I will lose the unattached person unless I do significant followup right away. For my public tree, one possibility besides highlighting that the hypothetical nature of the connection would be to call the person "living" even if in the 18th century. This would "privatize" the connection until I was able to determine whether a connection is correct or not. I put the word "MAYBE" or "NOT LIKELY" in as a first name, preceding the person's own first name, and put the person into the family where he or she might belong. That keeps me aware of her while warning me (and others) that there is still doubt. Depends. If I'm working all of one surname in a county, I make a Family Tree Maker file just for that. "Dickinsons in New York, 1790-1850" for example, while I work the census'. I get an alpha list and sources list, and plenty of room to write my notes.